Below is a viewpoint from Chapter 4 of the Foresight Africa 2019 report, which explores six overarching themes on the triumphs of the past years as well as strategies to tackle the remaining obstacles for Africa. Read the full chapter on fixing fragility. Climate change acts as a conflict multiplier by amplifying existing environmental stresses, creating new ones, and thus exacerbating resource scarcities and water and food insecurity. Governance and institution weaknesses amplify the effect of climate change on conflict. Based on recent research on farmer-herder conflicts in Niger, my team and I argue that increased reliance on local institutions through deeper decentralization of governance could mitigate conflicts. Niger is a landlocked country in the Sahel region of West Africa, with a semi-desertic environment and low and variable rainfall. Niger’s economy is heavily dependent on farming and herding. 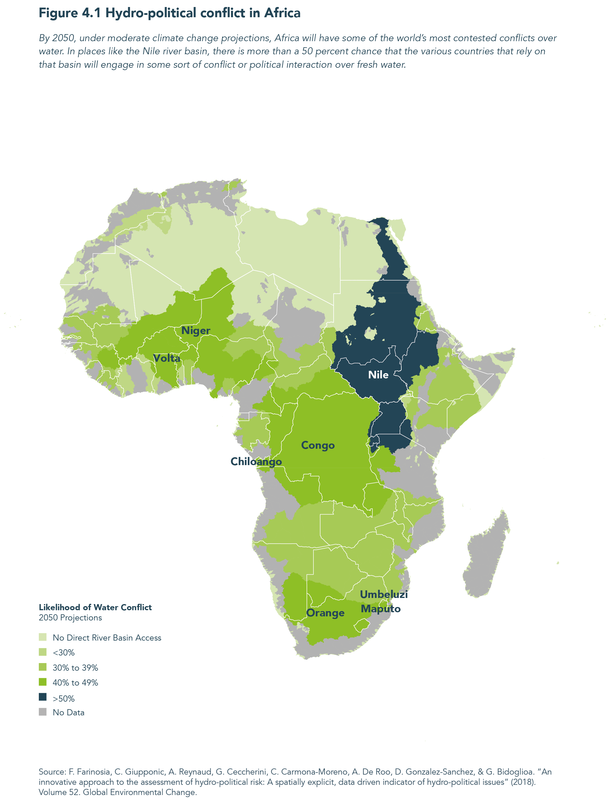 Population growth, which is among the fastest in Africa, and climate change are squeezing access to freshwater, leading to conflicts over control of scarce resources. In the latest outbreak of violence in November 2016 in the Tahoua region, 20 people were killed and 43 injured in a battle between farmers and herders. Likewise, 10 people were killed and 13 injured in November 2014 in the town of Birni-N’Konni in the Tahoua region. In the Tillabery region during 2010, more than 50 herders were killed when conflict broke out between herders from Mali and Niger. While population growth and climate change are major contributors to rising tensions, institutional failures are also a factor, such as government failure in defining and protecting property rights and providing justice and security. Institutions are known as the formal and informal rules and norms that organize social, political, and economic relations. Informal institutions, which consist of unwritten norms, customs, and traditions, such as the ones governing kinship and religious networks in West Africa, overlap with and usually overwhelm formal institutions in some areas like land rights. In many instances, they undermine formal ones; in others, they substitute for them. In Africa, formal institutions, such as the central government and related bodies, are characterized by an over-centralization of governance, leading to burdensome rules and regulations and corruption, and, more importantly, weak decentralization schemes. Management of such local issues as education, health, reliable policing, and land rights is dealt with by the formal institutions at central government. Farmer-herder conflicts usually arise out of the inability of this system of governance to resolve disputes. Empowering local informal institutions, which are more trusted and respected, could bring greater effectiveness in conflict prevention and resolution. Moreover, informal institutions often seek civil solutions in addressing conflicts, such as mediation, adjudication, reconciliation, and negotiation, which are found to yield superior outcomes compared to dysfunctional formal institutions such as courts and police that often cultivate further resentment. As climate change puts more pressure on already fragile areas in the Sahel, it will become ever more important to find ways to nurture cooperation and peaceful resolutions to disputes over resources. From our research, stronger local governance through the power of informal institutions proves promising as a path forward.